On Saturday, March 4th, C.H. 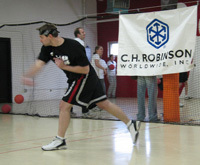 Robinson Worldwide, Inc. (CHRW) employees participated in the 2nd annual CHRW Dodgeball Tournament for CKF. CKF provides support, care, and comfort to kids and their families that are coping with cancer and blood disorders. They help with over 80 programs that provide entertainment, education, and day-to-day support to families who have become part of the hematology/oncology program at Children's Hospitals and Clinics of Minnesota. The tournament raised over $40,000. The tournament was played at the National Dodgeball League Dodge-It Center, located in Minneapolis. A total of 28 teams--168 brave players-- participated. Many CHRW families, friends, and co-workers came to cheer on and support their favorite teams. Dr. Sencer, Director of Hematology/Oncology at Children's Hospital, stressed the importance of cancer research and the impact that fundraisers like these have on the success of cancer research. Last year, the tournament raised $30,000-making the CHRW Dodgeball Tournament the second largest fundraising event for CKF. The teams each played nine games in a round robin tournament. After two hours of playing, the teams went into a sudden death tournament. Molly DuBois, vice president of transportation, said, "The competitive spirit that embodies the culture at Robinson definitely comes out during this tournament. If you think it's like your elementary gym class dodgeball-it's not. It's a great way to spend an afternoon to support a wonderful cause." The competition was tough, but the Chuggers pulled together and won the tournament. Jennifer Hanson, Chugger team captain, said, "There were a lot of good teams representing CHRW. Fortunately, we had practiced the 5 d's of dodgeball: dodge, duck, dip, dive and dodge and we believe that's what got us where we are today-dodgeball champions." Prizes were given out to the 1st, 2nd, and 3rd place winners. There were many creative team outfits, but Alanna Blaschko, Blake Ziebol, Derek Schaefer, Ryan Laden, Shonda Taylor, and Troy Nelson, representing the Minneapolis International, T-Chek, and CHRex branches, won hands down when they showed up, nearly unrecognizable, in Lynyrd Skynyrd t-shirts and mullets. Team KolqH8 finished second and raised the most money as a team, and ROSS Rage had just enough fury to place 3rd. To view pictures of the tournament, click here. Founded in 1905, C.H. Robinson Worldwide, Inc., is a global provider of multimodal transportation services and logistics solutions, serving over 20,000 customers through a network of 196 offices in North America, South America, Europe, and Asia. C.H. Robinson is one of the largest third-party logistics companies in North America, with 2005 gross revenues of $5.7 billion. For more information about our company, visit our Web site at www.chrobinson.com.